almost from the earliest invention of the image type, even though the style of the figure has varied depending on date and geographical location. The term iconography refers to the forms or characteristics of an image, whereas style refers to the ways in which these forms or characteristics are crafted or made. The iconography of the Buddha image includes representing the Buddha as a Monk, wearing a monk’s robe, and with his hair shaved. A monk wears 2-3 simple items of clothing, including an untailored and unsewn underclothes (antaravāsaka), a rectangular cloth worn like a skirt that reaches to the ankles and is folded under at the waist or belted with a piece of cloth. There are 2 ways to wear it, either covering both shoulders or under the right armpit. A third cloth, which is rarely worn, except in cold climates, is sometimes folded and placed over the left shoulder during special ceremonial occasions. The actual monk’s robes are dyed in shades of yellow. although artists tended to arrange the cloth in various decorative ways, such as producing a perfectly symmetrical fall of the robe on both sides of the body, or fashioning the folds in rhythmic patterns. With a stroke of his sword he removed his long topknot, and some texts note that the remaining hair formed small curls that turned toward the right. Indian artists by the 2nd century C.E. depicted the Buddha’s hair as small ringlets over the head, which came to be called snail-shell curls. In some artistic traditions, these curls developed into rows of small bumps. but others, such as his cranial protuberance, could be depicted. The extent to which the artists attempted to reproduce the lakṣaṇa varied according to place and time, but the cranial bump became standard for most images. Thus, he consistently has 2 arms, unlike images of Hindu deities from the same period, who often have multiple arms. One popular early type depicted the Buddha seated with his legs crossed and his right hand held up with the palm out. Although artistic depictions of these gestures and postures developed over time and came to be associated with certain narrative events, they are highly restricted in number and reappear again and again. Thus, the shared iconography - the monk’s robe, shaved hair, certain bodily marks, and limited hand positions and body postures - have made it possible for the Buddha image, no matter the style, to be identifiable across time and geography. 2. Gandhāra, a region centred on Taxila in present-day Pakistan. Although the iconographic parameters outlined above were generally followed in both places, the Gandhāra images are related to Western classical (Roman and Hellenistic) art, whereas the Mathura images are related to the North Indian style seen in earlier anthropomorphic sculptures of various local or pan-Indian deities, such as Yakṣas. The early Mathura type, such as the 9-foot-tall Buddha dedicated by the monk Bala, is a monumental image that stands with knees locked, staring straight ahead, his left arm akimbo with a fist on his hip. The robe is thin and transparent, revealing the body. The Gandhāra type, on the other hand, wears all 3 garments, completely masking the body underneath, the emphasis being on the pattern of the heavy, deep folds of fabric. While these images vary considerably, they share a modest size and nascent iconography that includes the uttarāsaṅga worn not as a covering robe but, like a layman, as a bunched shawl. All 3 religions were practiced in Mathura, and some of the earliest images developed there. Of the 3 religious groups, the Jains probably produced the first anthropomorphic icons at Mathura; these are tiny figures of their naked Jinas on stone reliefs dated to as early as the second century B.C.E. It seems reasonable to expect that the 3 religions interacted and competed at Mathura, with their anthropomorphic images developing together. Indeed, images from Mathura shared the same style, whether Jain, Buddhist, or Hindu. Given such evidence, it is likely that the first small, rather indifferent, Buddha figures were created around the 1st century B.C.E. It is unlikely that such figures were the focus initially of worship or an icon cult, although by around 100 C.E., when the Bala and Gandhāra Buddha images were created, such cults were certainly in place. Still, assuming the Buddha lived in the 5th century B.C.E., it is of interest that no anthropomorphic images of the Buddha existed until some 400 years after his death. Although the famous King Aśoka of the 3rd century B.C.E. was predisposed to Buddhism, the only artwork from his reign that might be labelled Buddhist is the single lion capital with a wheel (cakra) from Sārnāth. At these and other sites, extensive narrative reliefs depicting the Buddha’s life stories and past lives (Jātaka) were carved in stone. However, even though the Buddha as a human being could be shown in such Jātaka scenes, he is not represented in any reliefs of this period. How to interpret this absence is at the centre of extensive scholarly debate, but the initial absence accentuates the importance of Buddha images created later. The early Buddhist sites in India clearly show that the Stūpa (and thus the relic enshrined therein) was the focus of worship. Other symbolic forms, such as the tree or the wheel, were also worshiped. There were extensive narrative reliefs associated with these sites, particularly with Stūpas. Eventually, anthropomorphic images began to be used in depictions of the Buddha’s life stories. It appears that interest in the anthropomorphic images lay more in their narrative function, and not in their function as icons. The popularization of an icon cult may have been an innovation of a few clerics, most particularly the monk Bala and his associates, who placed enormous Mathura Buddha images at several sites in Northern India. 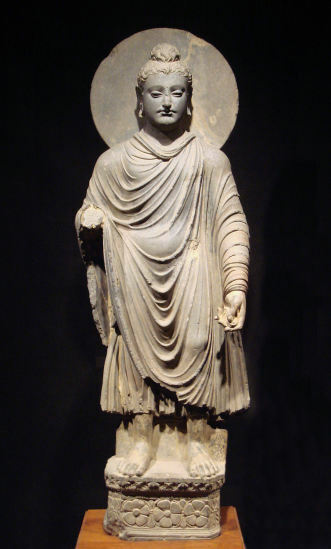 Very quickly, however, the Buddha image became widespread in South Asia. Certain places and periods had favourite image types, and the different Buddhist schools, such as Theravāda and Mahāyāna, used and interpreted Buddha images in different ways. Nevertheless, the actual images themselves remain iconographically consistent. Various regions and periods favour certain dominant types of Buddha images, with a limited number of secondary forms. Theravada Buddha images are extremely limited in their iconography. Almost all seated images in Śrī Lanka, for example, are in meditation. However, the fact that an image might be in earth-touching gesture, for example, is not itself sufficient to tell us whether it is Śākyamuni at the moment of calling the earth to witness or rather the Mahāyāna Buddha Akṣobhya. There is no difference artistically. This issue calls into question whether we can even speak of Mahāyāna art, at least in terms of Buddha images. Rather it is context, not iconography, that defines the image. Likewise, the Buddha images reflect no difference in the way the different bodies of the Buddha (the trikāya) are represented. It is only when we move to the Vajrayāna Buddhist systems, such as those of Nepal and Tibet, with new definitions of the Buddha and his body, that the art becomes clearly differentiated.